An elastic-sided ankle boot that fits well and includes a pull on hook for ease of wear and removal. 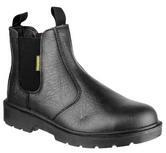 The Amblers FS131 has an antistatic rubber PU sole helping to make the boot comfortable. 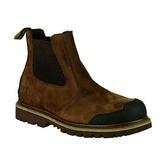 A steel toe and midsole also provides additional protection along with an energy absorbing heel. 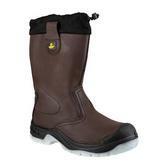 The boot is also water resistant and heat resistant up to 300°c. The amblers SF5 safety dealer boot features handy pull-on loops. Elasticated sides for a secure fit, steel midsole and toe protection. 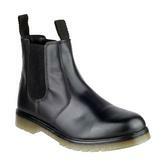 Durable rubber welted sole. These come in a unisex size range. Crafted with a rugged water-resistant crazy horse leather upper, enabling feet to stay dry and comfortable. Elasticated twin gusset opening with rear leather pull loop. Additional support - TPU heel support and moulded PU scuff cap. Amblers Safety AS200 Skiddaw - 200 Joule protective steel toe cap and steel midsole. 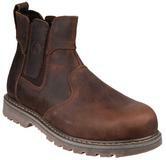 These classic tan safety rigger boots are produced using a tan leather upper. Comes with side pull on loops. Tough double density polyurethane sole unit which delivers good traction on a wide range of surfaces. Perfect for use on construction sites these unisex safety riggers are ideal for both men and women in the workplace. Toe protection is provided by a safety steel toe cap and steel midsole which is designed to protect the underside of the foot from penetration of sharp objects. This boot also includes faux fur lining for extra comfort. 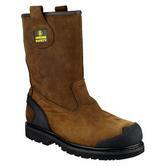 FS219 is a safety rigger with steel midsole and toe cap guard. The practical draw-cord and easy adjustable cord-lock stop water-drops and debris getting in to the boot. The tough, double density polyurethane sole extends to offer bump cap safeguard against abrasion and the upper is strengthened at the heel. The antistatic sole provides first-rate energy absorbing qualities in the heel strike area, decreasing daily foot-fatigue. Compliant with EN ISO20345 S3 safety standards. Amblers FS143 is a safety rigger boot with steel toe and midsole that is both slip resistant and anti static. 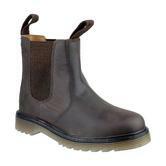 This full grain leather boot is waterproof and oil resistant, and conforms to ISO20345:2011 standards. The Amblers FS97 Safety Rigger Boot comes with steel toe and midsole protection. PVC sole with energy absorbing heel and wide tread for use on a wide range of terrain. Comfortable faux fur lining and soft leather rim with leather pull loops. Ribbed metatarsal and heel protects the upper foot and heel area. Resistant to many different minerals such as vegetable oils and fats, animal by-product, manure, disinfectants and various chemicals. 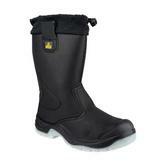 Hardwearing waterproof Rigger boot from Amblers Safety. 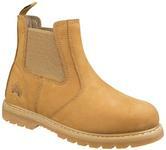 Rigger Boot with 200 Joules steel toe cap and Steel midsole penetration resistance 1100 Newtons. 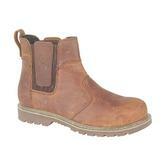 Amblers Safety AS249 Cadair are made using fully waterproof Crazy horse leather upper. Breathable waterproof membrane and moisture wicking mesh lining. PU scuff cap and anti-static and energy absorbing heel. 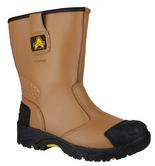 Amblers Safety FS142 pull-on safety rigger boot comes with steel toe cap and midsole protection. The lined upper is fully water resistant, and the integrated scuff cap shields the toe giving a longer boot life. The dual density PU sole means the FS142 is not only comfortable, but very hard wearing. Water resistant upper keeps feet warm and dry. 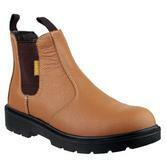 Chelsea work boot made to offer a product featuring great look, flexibility and wearer comfort. Hardwearing and durable nitrile rubber outsole. 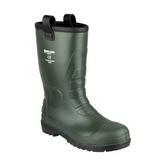 Amblers AS175 Safety Dealer Boots conforms to: EN ISO 20345:2011 SB-P SRA. 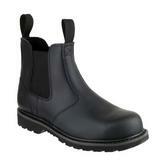 Amblers safety Dealer and Rigger Boots are suitable for heavy duty work on and offsite. Made with resilient, durable leathers, these slip-on boots protect you from impact, underfoot puncture and water. 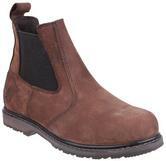 Boots like the FS128 dealer boot are approved to EN20345 (Highest Footwear Safety Standard). 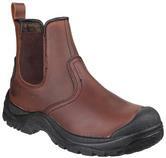 This boot has a reinforced steel toe cap capable of withstanding impact up to 200 joules. Amblers Rigger and Dealer boots have been designed to be secure and easy to pull on or take off. The FS334 Unisex Rigger boot - like many others - was designed with pull on loops - making it even easier to get up and going.